In Establishing Eden, Broersen & Lukács focus on the establishing shot: the moment a landscape is identified and becomes one of the main protagonists in a film. In blockbusters like the film series Lord of the Rings (Peter Jackson, 2001-2014), these shots were used to capture and lay claim to the nature of New Zealand, propagating it as a new Eden, evergreen and unspoiled. Here fiction takes over from reality: mountains and forests exist under the names of their cinematic alter egos. 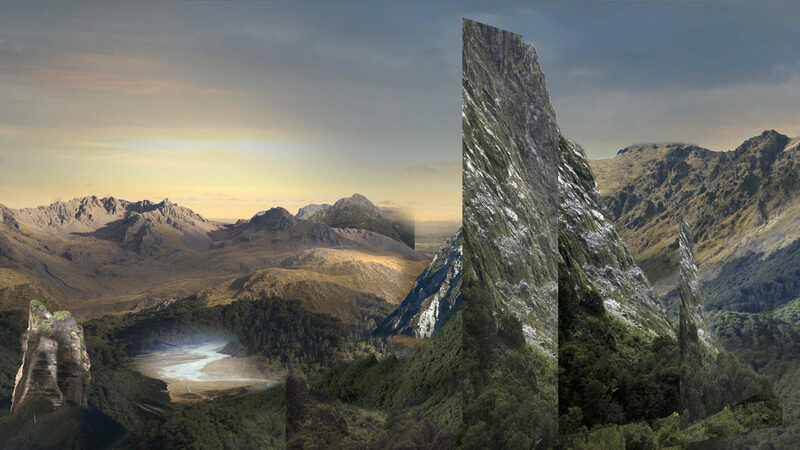 Broersen & Lukács travelled through the wilderness of New Zealand to capture these landscapes, and in so doing, they have reappropriated the nature of New Zealand. Creating an architecture of fragments connected by the camera movement of a perpetual establishing shot, they show this Eden as a series of many possible realities, an illusion that comes together just as easily as it falls apart. Persijn Broersen (Delft, 1979) and Margit Lukács (Amsterdam, 1973) have worked together since 2002, after completing the Rietveld Academy/ Sandberg Institute and Rijksakademie, Amsterdam. The duo makes films and installations in which ‘nature’ functions as a mirror for our media-dictated culture, in which fact and fiction are closely intertwined. Their work has been shown in, among others, Stedelijk Museum Amsterdam, Kröller Muller Museum, Biennale of Sydney (AUS), Karachi Biennale (PK) and Centre Pompidou Paris (FR). Recently they completed a brickwork folly commissioned for the new NoordZuid-metroline in Amsterdam.This autumn their work will be shown in a solo exhibition in Foam, Amsterdam.